Sam Missin (front left) with the England Under 18 Boys team that won silver medals. Four Peterborough rugby players returned from the European Junior Touch Rugby Championships in Stirling, Scotland at the weekend with medals. 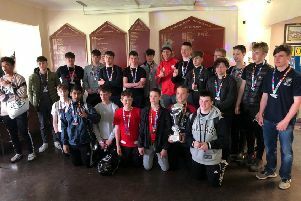 Sam Missin was in the Under 18 Boys team that won silver, Ben Dobson was in the Under 18 Mixed team that also came away with runners-up medals and Harry Missin and Logan Noble were in the Under 15 Mixed team that won bronze. Ben Dobson (back row, second left) with the England Under 18 Mixed team that won silver medals. Sam Missin from Whittlesey, an England regular for the past three years, came mightily close to winning gold. He ran in a late try in the gold medal match against Wales as England went 6-5 ahead with the clock running down. But Wales scored after the hooter, then again after the tap-off, and with England not able to reply it was the Welsh who had the gold medals around their necks. Prior to the final, England’s only loss had been to Wales in their last game of the round-robin stage. Harry Missin (front third right) and Logan Noble (back fourth right) with the England Under 15 Mixed team that won bronze medals. Dobson, competing in his second European Championships with the Mixed Under 18 squad, also got to a gold medal match. Unfortunately their only defeat of the weekend came in that contest against Scotland. They won six of their eight group games, drawing against both Scotland and Wales, but in the final the hosts ran out 8-5 winners. As with the Mixed 18s, the Mixed 15s, which included Missin from Whittlesey and Noble from Werrington, had seven different opponents in the round-robin stages. They won five of the matches and lost to Wales and France. The semi-finals went to form, Wales beating Scotland and France beating England, which put England into an Anglo-Scottish match-up for the bronze medal. Mixed Under 15 Team: 1 Alana Gauntlett (Crewe and Nantwich), 2 Anna Reeves (Percy Park Pirates), 3 Flori Nasir (Canterbury), 4 Olivia Walker (Wandsworth), 5 Phoebe Simon (Nottingham), 6 Thea Dawson, 7 Connor Hughes (Canterbury), 8 Elliot Nye (Canterbury), 9 Harry Missin (Canterbury), 10 Isobel Penniceard (Wandsworth), 11 Logan Noble (Peterborough), 12 Matthew Mayall (Canterbury), 13 Max Penniceard (Wandsworth), 14 Tom Penniceard (Wandsworth), 15 Tom Lawton-Davies (Thames Valley Vikings), 16 Tom Pollard (Nottingham).